-Clarence, NY shop selling smokers, BBQ, grills, rubs, sauces, spices, and accessories. Take advantage of the deals on frozen turkeys but stick them in your freezer for future use. For Thanksgiving spend the extra dollars and get a fresh turkey. I speak from experience: not having to worry about thawing alone makes it worth the price. Most of our local grocery chains carry them. If using a fresh bird, plan on either dry or wet brining. If wet brining see if the butcher counter can provide you a turkey size box. If you line the box with a food grade bag (like a Reynold’s turkey bag) it will give you a nice compact structure for brining that has a chance of fitting into a refrigerator. Make sure you have a sturdy pan for the bird. If using foil pans, stack two for added support AND use a sheet pan underneath, otherwise you run the risk of the pans bending and bad things happening. Again I speak from experience, but even after a few years it is still too painful to think about–move along people, nothing to see here. Don’t over season, don’t over smoke. Your bird should taste like turkey, not like seasoning or a cigar. Use a moderate touch when seasoning and don’t use a lot of smoke wood. When in doubt, use less. 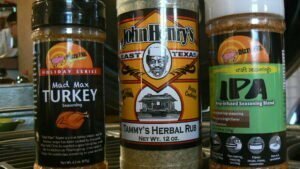 We carry a lot of rubs that will work but our top three recommendations are “John Henry’s Tammy’s Herbal Rub”, Dizzy Pig’s “Mad Max Turkey”, and Dizzy Pig’s “IPA”. Have a great Thanksgiving everyone! !